If you haven't read Six Impossible Things, click over here. If you don't care about book chronology (and I won't hold that against you, much), then keep reading! 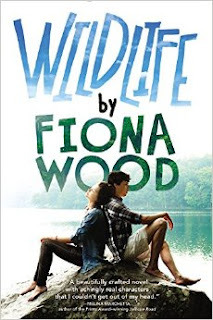 Wildlife is Fiona Wood's second book, but the first one published here in the U.S. Set during a tumultuous term at their school's wilderness campus, this story follows two very different girls who are both somewhat lost, confused, and searching for their true selves. Sibylla has never been the center of attention, but in a strange twist of fate she ends up as the one-time model for a popular ad-campaign, fanning the flames of her best friend Holly's long-held jealousy. Lou is the mysterious, quiet new girl who's not interested in fitting in or being liked. Tensions, rivalries, and emotions run high as the wilderness term tests everyone's limits. Wildlife trades perspective between Sib and Lou, who are two very different narrators. They barely know each other at the beginning of the novel, and at first it seems like a semester in the woods is the only thing that they share in common. Lou is still reeling from the death of her boyfriend and first love, and her chapters are meandering, occasionally short and abrupt with her grief. Sib is more relaxed and cheerful, and her worries don't seem to be any heavier than wondering where she stands with the cute boy she kissed at a party, but she's struggling to understand and define herself and lets other people influence her in the meanwhile. On their own, each of the voices might become exhausting, but Wood balances them out brilliantly. Lou's quiet observations complement Sib's social interactions, and the two characters slowly start to come together via Michael, who is very much (secretly) in love with Sib, and as a result of Holly's increasingly cruel manipulations. Wood's writing submerges the reader into the minutiae of the girls' daily lives and their social circles, and even though the plot isn't terribly dramatic, the shifting relationships are all fascinating. The inner lives of Lou and Sib and how they slowly open up to the world are what drive this book, and their experiences and revelations make for a beautiful, deceptively complex novel about the nature of friendship, loss, and the importance of honesty. Fiona Wood is now officially on my Author Watch List, which sounds way creepier than it really is. Book received as a gift! At Christmas. I know. But hey, I finished all of my Christmas books before June! That has to be a record.